Altitude range: 600 to 2.500 metres above sea level. 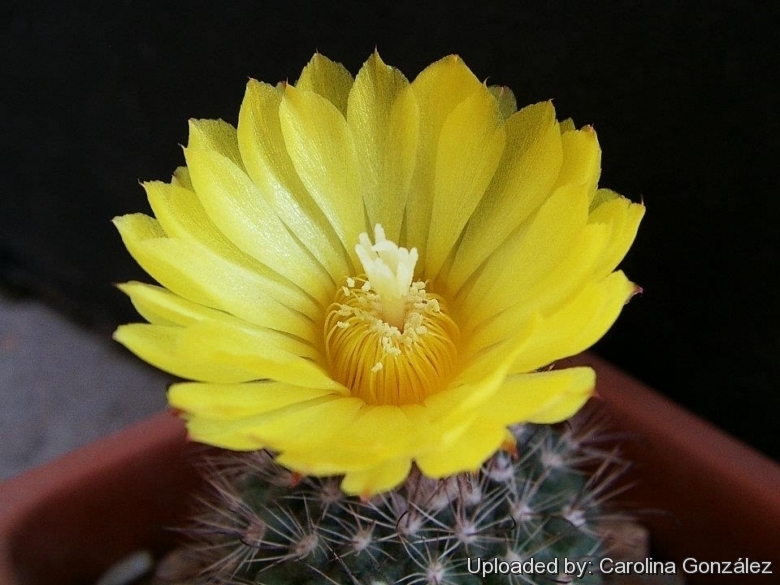 Description: Parodia microsperma var. setifera is a morphological or geographical form of the extremely variable Parodia microsperma. Characteristic of this frequently offered cactus are its thin bristly radial spines and its yellow flowers. Derivation of specific name: The specific name “setifera” means “bearing silky bristles”, probably in reference of the thin silky spines of this species. Stems: Solitary, when young flattened-spherical, up to 80 mm wide, dark green, becoming elongate as high as 150 mm or more in older specimens; crown woolly and slightly depressed. Ribs: About 18 narrow, 6 mm high, not slitted in tubercles with areoles separated only by shallow grooves so that the ribs can be easily defined. Areoles: Oval, slightly white tomentose, 6 mm apart. Radial spines: About 20 white, thin, bristle-like, 5-8 mm long. Central spines: 3-4 needle-like, reddish to black, usually lighter toward the base, 10-30 mm long; the lowermost one the longest, hooked or slightly bent at the tip, other central spines straight. All central spines at first almost vertical, with time the strongest ones curve downwards. Flowers: About 35 mm long and wide, pale yellow. Pericarpel 6 mm wide, yellow-green at base, scales about 1 mm long pink in the upper half, with short wavy bristles. Floral-tube yellow, with narrow, about 2 mm long, pink scales, with abundant white hair and dark bristles. Tepals inside and outside pure yellow with no traces of red colour, 4-5 mm wide. Filaments yellow. Fruits: Spherical, thin, brownish-green or reddish-brown. Seeds: Sbout 0.3 mm in diameter, medium brown, shiny.